Jake Whyte lives on an old farm on a small British island, tucked away from the world with her disobedient collie named Dog. However when her flock of sheep start dying from mysterious and horrific circumstances, Jake has to engage with the rest of the island in order to find out what is happening. All the Birds, Singing is about running and hiding from the past and dealing with isolation and loneliness. The novel is told in alternating perspectives from the protagonist. One follows everything that happens after finding one of her sheep dead from mysterious circumstances. The other works backwards from that point and explores Jake’s past and why she is running away from it. It is a unique way to tell the story but it also serves as a metaphor for the way Jack is trying to distance herself from her past. However, while reading the novel, she also realise how much the past effects and stays with her, no matter how hard she tries to escape it. It feels like Evie Wyld has an interest in the outsider and exploring a disconnection from a place/society. There is a struggle between Jake’s need to make a connection with her need to isolate herself from the world; this is what really captivated me about this book. Wyld was born in Australia and now lives in England and I am curious if this theme is something she has struggled with herself. I have heard her first novel After the Fire, A Still Small Voice deals with similar themes but I don’t think I will know for sure until her planned graphic memoir is released later this year. 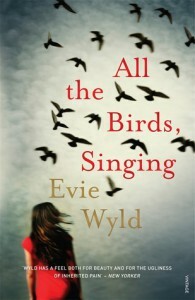 All the Birds, Singing is a beautifully lyrical and atmospheric novel that deals with some pretty heavy themes. I put this novel off for so long, mainly because it won the Miles Franklin literary award and it was getting far too much attention. However it was picked for my book club in the middle of 2014 but because I was in America while this was happening I missed the chance to read and discuss the novel. I finally decided to pick up the book and I was blown away.